My daughter has been practicing decoding with the Interactive A Workbook from ABeCeDarian Company. According to the website, "ABeCeDarian Company publishes and distributes the ABeCeDarian Reading Program, a research-based, explicit, comprehensive, multi-sensory decoding program developed by Michael Bend, Ph.D. The program efficiently addresses the key areas of phonemic awareness, phonics, and fluency. It provides the depth and structure necessary for tutors, interventionists, and special education teachers to help the weakest readers from age 5 to adult make outstanding progress. The beginning levels of the program also make an outstanding program for a regular education teacher to use with her whole class. Upper levels of the program provide excellent word study materials for students in grades 3-6. The comprehensive and straightforward organization of the program make ABeCeDarian an excellent choice as well for home-schoolers." The interactive workbook can be used on a computer, a tablet, or a smartphone! The interactive workbook has the same lessons in sequence as the regular student workbooks. The online teacher's manual is necessary, but luckily you can download it here. In this manual, you are taught the why's of this program and how you can teach your child to read. It is 166 pages of information and it is useful to read through it before beginning your child on the program. It also includes detailed and scripted lesson plans for you to use with your child. There is no guessing with this program and it is completely laid out for you to use. The interactive workbook requires the parent to watch the entire lesson. There isn't feedback given so it is up to the parent to make sure the child is doing things properly. Each lesson has letter puzzles, handwriting practice pages, and eventually reading and writing sentences. My five-year-old daughter used the program on our laptop with a touch screen. The touch screen was helpful, especially on the handwriting pages. I'm not sure how easy using a mouse would work for the handwriting pages. My daughter enjoyed using it. She loves school time and having an online program for herself made her feel important. 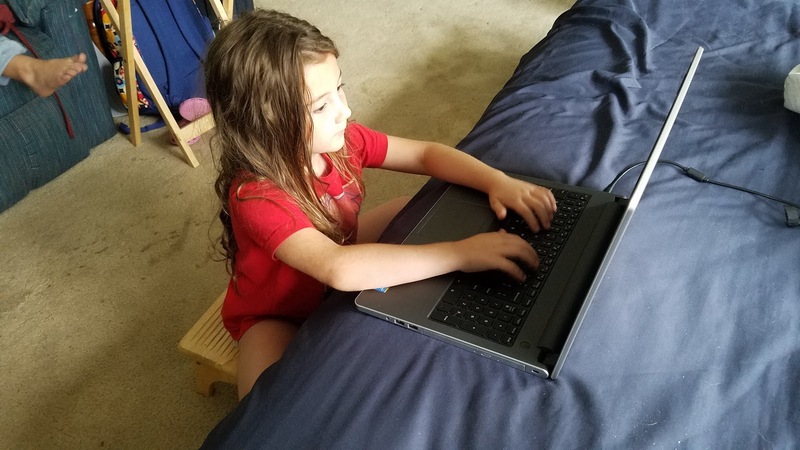 Although we aren't a huge technology in learning family here, it was a nice change for her. To be honest, I like the program but I think I would prefer the physical workbooks over the interactive workbooks. The teacher's manual is a TON of reading for me. It took a couple weeks for me to get through it before I could even start the program. If you are committed to the program, than that hurdle wouldn't be a problem. I just have a lot going on that trying to get through it was a bit of a slog. The biggest downside for me is that I had to stay with her the entire time she was working on the workbook. I couldn't just let her do it and then come back to check on her. Being a momma of three (almost four) it ended up taking a lot of time out of my day. Overall I think it was a decent program just not a great fit for my family. I think families that love technology in their school would love this program. I can also see this working down the line. Once you learn how to use this program you can use it for each child learning how to read and you wouldn't have to relearn a new program.